“My people were headhunters ...until the missionaries came and we stopped in 1872.” Apong spoke these words and then paused briefly to let that one sink in. I’d heard about it before, so I watched Phil’s face to gauge his reaction to this news. He nodded coolly. “That knife I used to cut the pork? Yeah. We used to use that to chop off the head.” Apong clearly revels in telling this story, and I’m pretty sure the detail about the knife is his favorite part. He said all this with glee. This was just one of many revelations that came out of lunch with the Indian missionaries today. At Interval Thursday, Apong told me he’d acquired some fresh pork and he planned on making his famous Tibetan Momo (his term for something very similar to what we in America refer to as a “pot sticker”) today. He invited me and Phil, who was in town for Champ of Champs, to come for lunch. Phil and I were quick to accept the invitation, but there was a small amount of apprehension this morning. On the one hand, Peace Corps Volunteers and CWM missionaries are two peas in a pod. We have a common foreigner status, and we can empathize with each other. On the other hand, we’re foreign to each other. And then there’s the whole secular issue. Would this luncheon work? 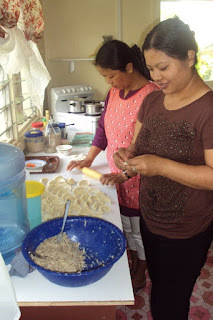 When we arrived, Maengi, Thanpuii, and Rachel (the missionary who teaches at Koa’s school) had formed an assembly line in the kitchen to assemble the momo. Apong was sweating over the stove, his wife Zorin was playing with the baby. But upon our arrival, everything stopped briefly so everyone could shout their greetings. There was love. While the momo steamed (in Apong’s 5-tiered steamer he brought specially from home), we took a walking tour of the campus. Apong and Zorin live about halfway up the mountain at a school that was founded in 1891. It’s gorgeous—there’s a babbling brook, ocean vistas, a bamboo grove. 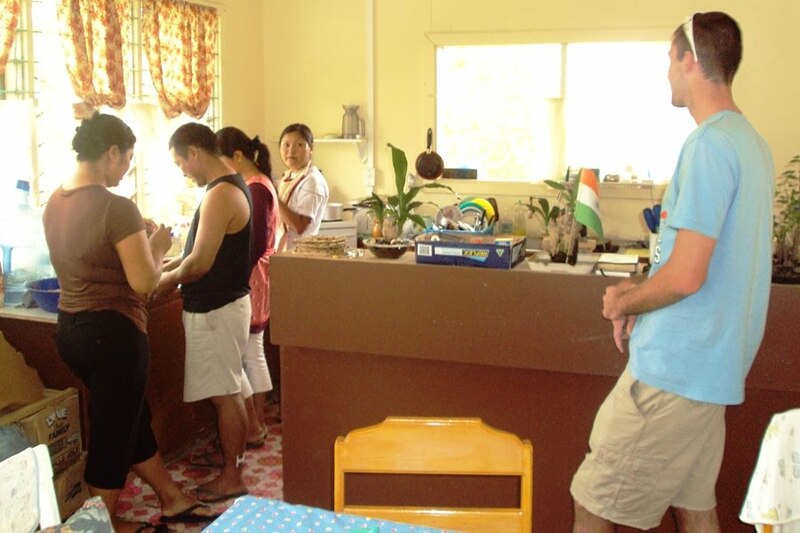 Back at the house over lunch, Apong regaled us with stories about all the different animals he’s eaten. Crocodile, snake, rat, elephant. “ELEPHANT? !” the entire table shouted. “Elephant,” said Apong. Maengi made a chili sauce from the Raja Mirchi plant Apong in his small garden. Apparently Raja Mirchi are some of the spiciest peppers in the world. Phil and I can now attest to this. All in all, the event was a great success. Great food, delightful conversation. What’s everybody doing next Saturday? The assembly line. Rachel in the background on rolling duty. 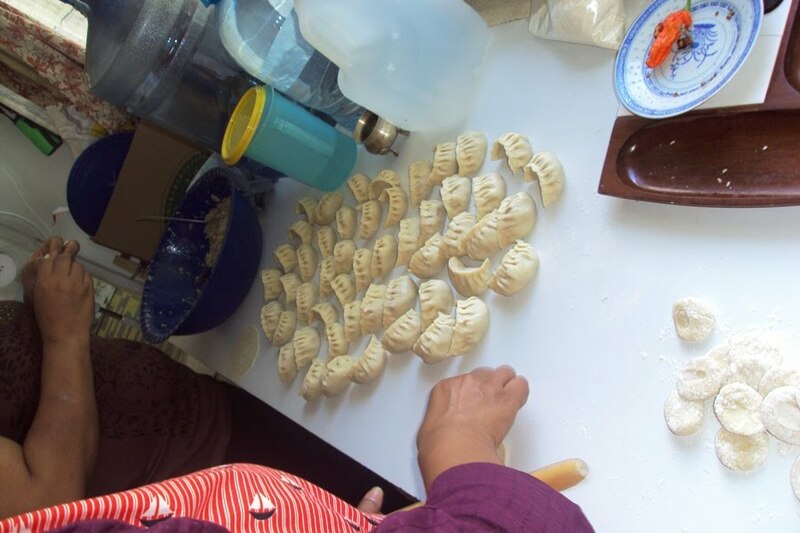 Thanpuii in the foreground stuffing and crimping. 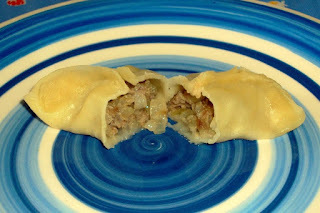 Stuffed momo waiting to be packed in the steamer. 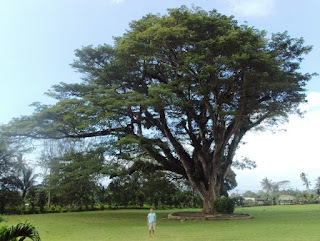 This huge tree is out in front of the school, and is said to have a spirit living within it. I made Phil stand next to it in the rain to give some scale to the photo. 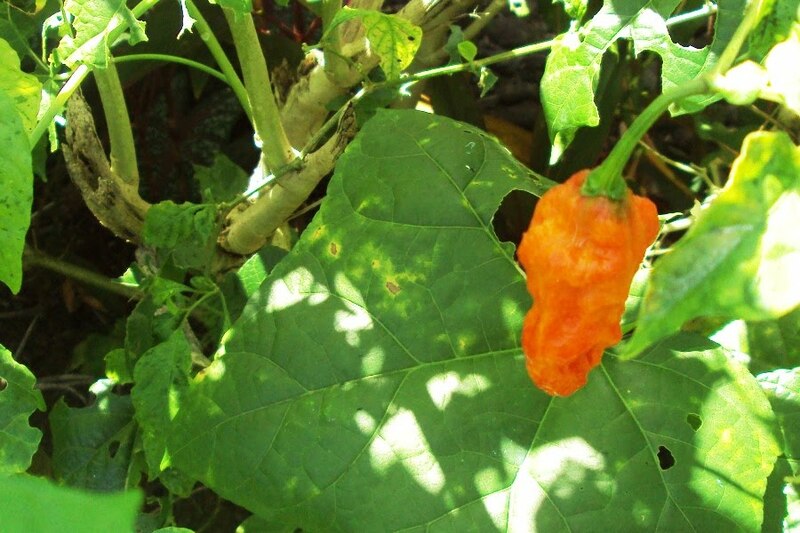 Raja Mirchi on the vine. Wow, I remember those chili peppers. We ate them thinking they were sweet, but it was awfully spice. We ran home looking for sugar!! !